Mirasvit and Mageworx provide extensions responsible for the autocomplete functionality, and we’ve already reviewed them. 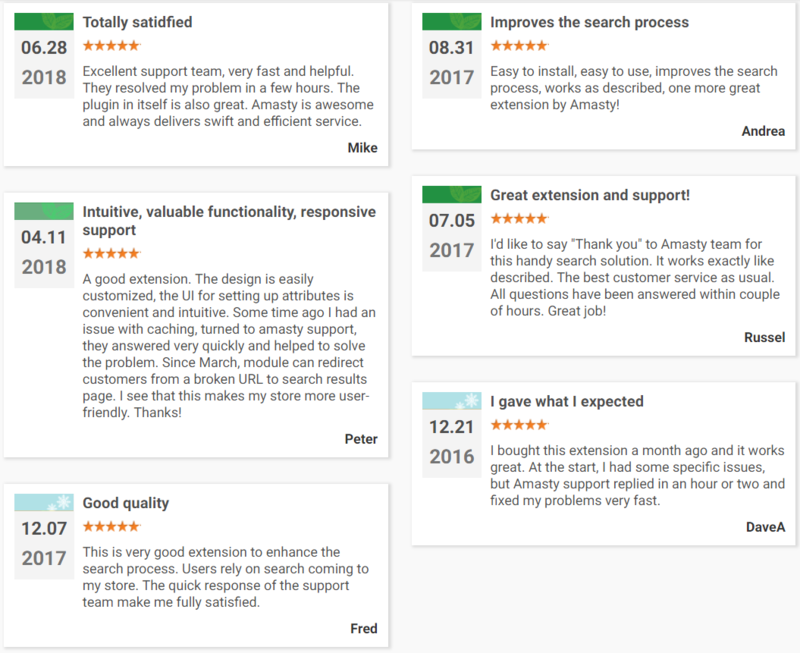 Today we’d like to say a few words about their competitor – Magento 2 Search Autocomplete extension by Amasty. The name of this tool is quite self-explanatory, but there are a few nuances to tell about. 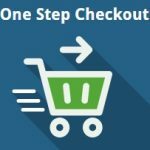 Robust search is a must-have feature for every ecommerce website since an average ecommerce store might have thousands of goods, but a particular customer is interested in one or a few products. Therefore, you need to help store visitors instantly find what they are looking for. Amasty Search Autocomplete for Magento 2 provides several features necessary for achieving this goal. 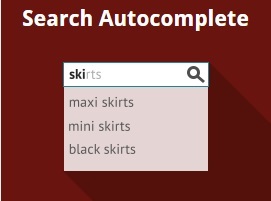 First of all, the Magento 2 search autocomplete extension displays an autocomplete popup with advanced functionality. The popup window displays recent searches on the first click, shows results based on popular searches, categories and CMS pages, highlights items on mouse hover, as well as provides the ability to display the “Add to Cart” button and product details (including reviews) right in the popup. Besides, the module allows you to configure the search results display using product attributes. 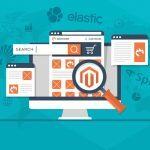 Another possibility provided by the Magento 2 tool is dividing search results based on categories, brands, and CMS, landing, and blog pages into separated sections in the popup window. You can also add tabs to the popup for more convenient navigation. As for improved shopping experience, with the Magento 2 search extension, you can utilize such features as a redirect to the product page in case of one search result and redirect to the search results page from a broken URL. Note that it is possible to fully customize the layout of the popup window. 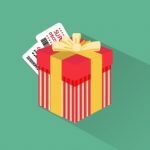 You can select various colors for different popup elements, as well as set autocomplete parameters, including a minimum number of characters required to trigger the search. 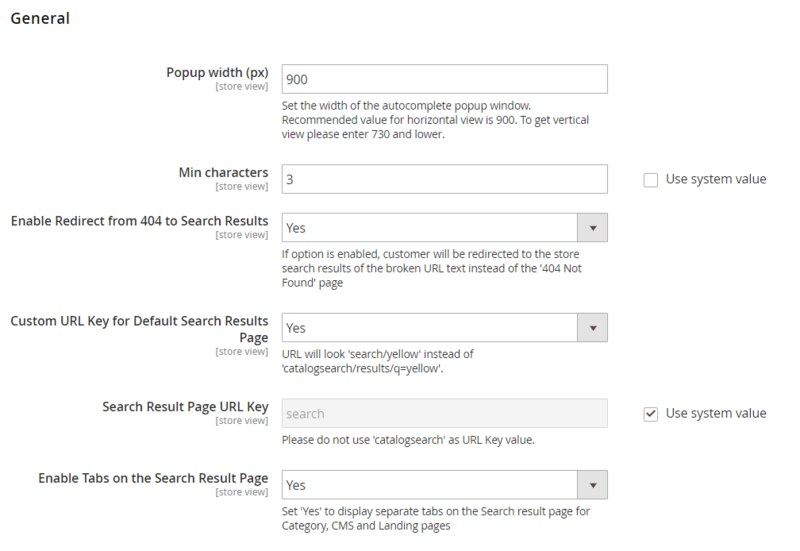 The Magento 2 search autocomplete extension settings are divided into 12 sections: General, Search Attributes, Recent Searches, Popular Searches, Categories, CMS Pages, Products, Landing Pages, Brands, Blog, Custom Layout, and Elastic Search. The first one allows you to specify such parameters like popup width, a minimum number of characters to start the search process, as well as redirect to store search results from a broken URL. It is also possible to set a custom URL for the default search results page, create a URL key for search result page, and enable separate tabs for the search results based on products, categories, CMS, or landing pages. 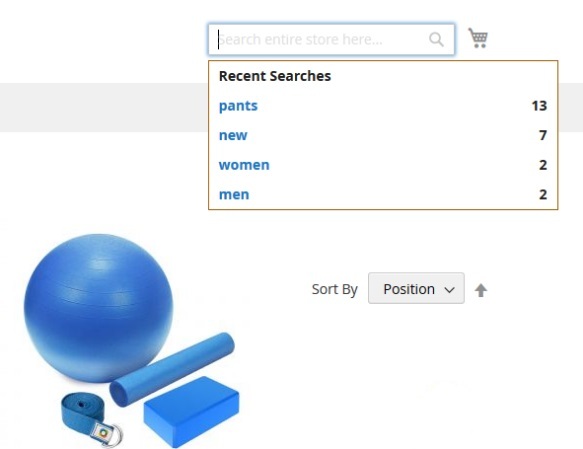 In Search Attributes, you can add all the necessary product attributes and specify their weight in search results. As for Recent Searches, you can activate this feature by activating the “Show on first click” parameter and enabling the functionality. Besides, it is possible to change the title of this block, specify its position, and set a limit on the number of results with the help of this Magento 2 search autocomplete module. 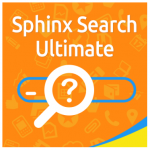 The same is about Popular Searches: you enable the feature, allow its display on first click, set its title, specify a position, and enter max results. Additional parameters for the Categories section are “Name Length” and “Description Length”. The same is about the CMS Pages section of the Magento 2 search autocomplete extension. 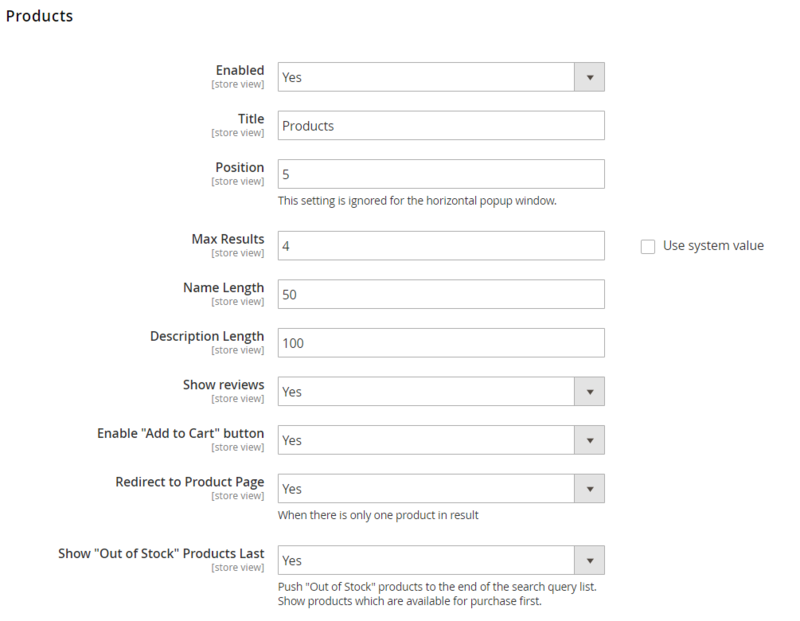 In Products, in addition to the similar options mentioned above, you can enable/disable the display of reviews and “Add to Cart” button and redirect to the product page for one search results, as well as show out of stock items at the bottom of the results list. As for the Landing Pages tab, here you enable/disable the search functionality throughout landing pages, create the block’s title, specify its position and the maximum number of results to show, as well as content and content heading length. In the Brands and Blog sections, you specify the same configuration parameters as for the landing pages. The Custom Layout section of the Magento 2 search autocomplete extension allows you to set custom colors for Text, Hover Text, Background, Highlight, Border, and Hover. In the last tab of the module’s general settings, you can set the elastic search feature. In the example above, you can also see the autocomplete function with the “Add to Cart” and “More products” buttons and reviews. 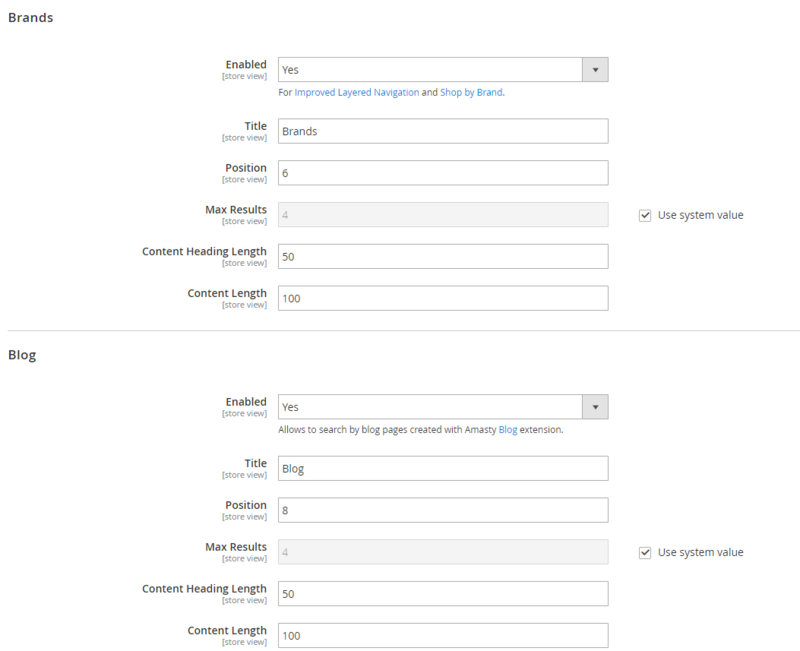 Now it is possible to utilize blog pages and blog categories created with Amasty Blog Pro for performing the search. New option: a section with brand pages can be added to the search results window. Compatibility with Amasty Shop by Brand allows performing the search based on the brand pages. Now Category, CMS, and Landing pages can be displayed in different tabs in the search results window. New function: configuration of SEO URL Key for the default search results page. Now out of stock items can be listed at the bottom of the search results, while currently available products are displayed first. Updated design of the autocomplete popup window: horizontal view display for the desktop and vertical view on mobile. 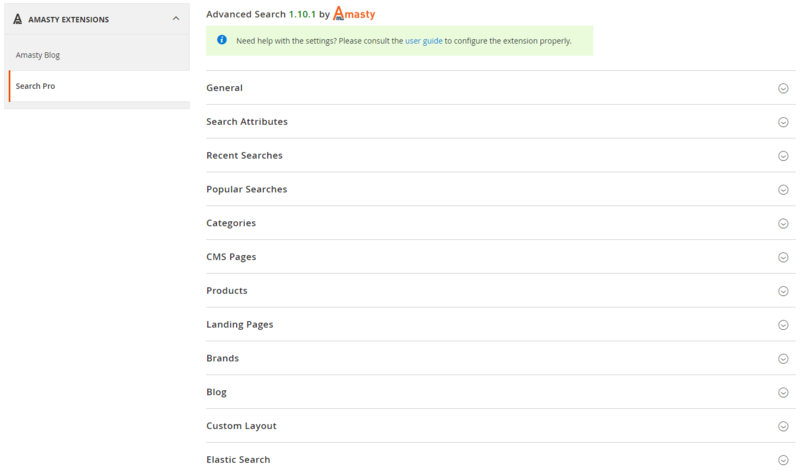 Now it is possible to perform the search based on landing pages if Amasty Landing Pages is installed. 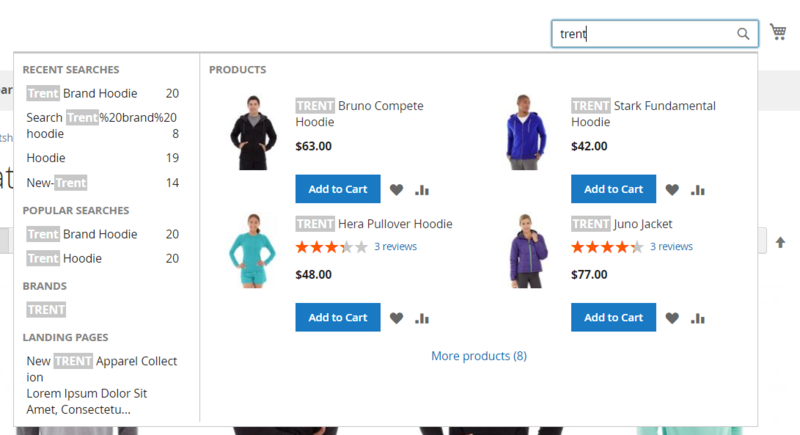 Now frontend users can be redirected to a store search results page if a URL is broken. Added the possibility to use NOINDEX and NOFOLLOW to prevent search engines from indexing search results pages when not needed. The module is compatible with the built-in Magento EE Solr and Elasticsearch. New: now, if only one product has been found, a user is redirected to the product page. A new option was created: now you can show “Popular” and “Recent” searches on the first click. Attribute relevance weight configuration was added.